Researchers at a Cambridge lab have found that our bodies can fight viruses not only outside cells but inside them, too, a discovery that will rewrite textbooks and one that could save millions of lives and vanquish the common cold. 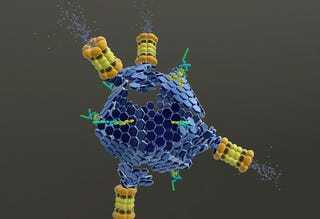 Viruses are responsible for roughly twice as many deaths as cancer, hiding away inside cells where up until now they've had refuge from antiviral drugs. Our fundamental understanding of cellular biology was that once a virus had infected a cell, the body had no way to fight it except to kill that cell off. This is the last opportunity a cell gets because after that it gets infected and there is nothing else the body can do but kill the cell...The antibody is attached to the virus and when the virus gets sucked inside the cell, the antibody stays attached, there is nothing in that process to make the antibody to fall off. The great thing about it is that there shouldn't be anything attached to antibodies in the cell, so that anything that is attached to the antibody is recognised as foreign and destroyed. The beauty of it is that for every infection event, for every time a virus enters a cell, it is also an opportunity for the antibody in the cells to take the virus out. That is the key concept that is different from how we think about immunity. At the moment we think of professional immune cells such as T-cells [white blood cells] that patrol the body and if they find anything they kill it. This system is more like an ambush because the virus has to go into the cell at some point and every time they do this, this immune mechanism has a chance of taking it out.